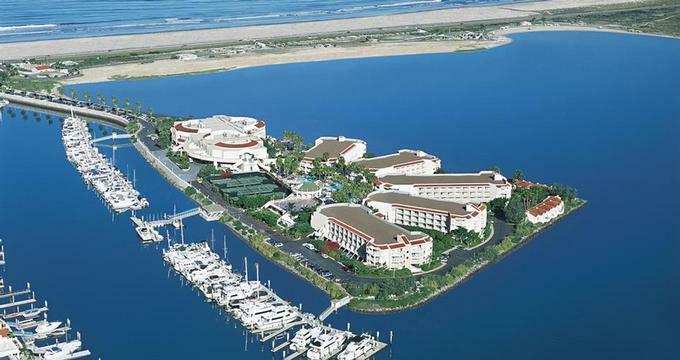 Loews Coronado Bay is a quick getaway from San Diego, just across the bridge from the city. This Southern California family resort offers travelers sunny beaches, newly renovated restaurants, three pools, a spa and great vacation packages. There are 439 rooms and suites, but not all face the water. Ask for one of the Luxury Rooms with a balcony with scenic views of the Pacific Ocean. There are four categories of rooms, all with deep soaking tubs, high-speed internet access and plush linens. Vacationers receive 24-hour room service which you can enjoy on your private balcony. Superior Rooms are more affordable and have garden views. Deluxe Rooms are a good option if you want a view of the water but don't need a balcony. The 37 luxury suites are uniquely furnished and have separate bedrooms and living rooms. Ideal for families who want more space on vacation, the living room has a queen-size sofa bed and the bathroom has a Japanese-style deep soaking tub. From the balcony, you can look out over the bay and the city skyline. Connecting rooms are available, giving you even more room in your suite. Mistral serves modern French cuisine and overlooks the Coronado Bay and colorful sunsets. The floor-to-ceiling windows let you observe the scenery in the distance as you dine on gourmet dishes. Market restaurant is a great option for families. The restaurant has marina views and serves Southern California cuisine. La Cantina serves salads, burgers, mojitos, cheladas and margaritas by the pool. If you are in a hurry with kids, get a takeout from the "Market To Go" which offers sandwiches, salads, ice cream and desserts. Sea Spa at Loews Coronado Bay offers a selection of massages, including Swedish, Couple's Massage and others. Body treatments and facials are also very popular. The spa offers treatments designed especially for teens, such as facials, make-up applications or lessons, manicures, pedicures and more. You can choose to relax on the sandy beach, next to one of the pools, or head to the activity center which offers many watersports. Activities include a range of water sports, biking and a tour. Rent a kayak or a sailboat and explore the bay. If you want to learn how to surf, head to the Coronado Surfing Academy that provides all the gear and professional instruction. Loews Coronado Bay is a great family vacation destination, offering programs for both younger kids and teens. The Kids' Club is outfitted by Pottery Barn Kids furniture and accessories. Children between the ages of 4 and 12 are welcome. They can participate in scavenger hunts, sand games and more. The Kids Club is open daily in the summer and by advanced reservation in other seasons. Click here for more great beach resorts with kids clubs. For older kids, the resort has a Teen Lounge with stylish accessories designed just for teens. There is a choice of video games and other activities. Rates at Loews Coronado Bay start at $189 per night. Click here for more great family vacation ideas.